PRODUCTS WHICH DO NOT CONTAIN RAW MATERIALS FROM ANIMAL DERIVED INGREDIENTS. PRODUCTS WHICH DO/MAY CONTAIN RAW MATERIALS FROM ANIMAL DERIVED INGREDIENTS. All dishes and menu items prepared with fresh chicken or meat. 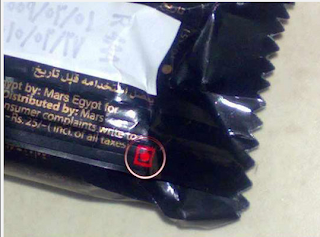 Mars Red Dot in Square = Pork / Gelatin? It's Shown Specifically At The Back Beside The Weight Numbers. Mars products always comply to the legal and cultural norms of all the markets it does business in. Mars products, including Snickers, Bounty and Mars bars do not contain pork nor pork derivatives. Mars products are exported to a number of markets, of which India is one; the red dot that may appear on some of our packaging is a legal requirement for the Indian Market. It indicates that the product may contain egg, which is not suitable for some vegetarians in India. Still, to further clarify the matter, we are currently completing the process of separating the packaging for the two markets which will minimize future misunderstanding. So what do we learn? We need to research before pressing the send button on these chain letter / forwards. Looking for Halal infant iron drops / syrup.There seems to be only two choices for canadian manufactured iron supplement in liquid form. Each 1.0 mL of liquid contains ferrous sulfate 75 mg (equivalent to 15 mg elemental iron). Nonmedicinal ingredients: artificial flavouring, citric acid anhydrous, ethyl alcohol, purified water, sodium bisulfite, sorbitol solution, and sugar. Alcohol: 0.16%. Each scarlet capsule, printed "PALAFER" in white ink on the body and cap, contains ferrous fumarate M.D.I. (micro dispersible form) 300 mg representing 100 mg of elemental iron. Nonmedicinal ingredients: D&C Yellow No. 10, FD&C Red No. 2, FD&C Red No. 3, FD&C Yellow No. 6, gelatin, lactose, povidone, sucrose, talc, titanium dioxide, silicon dioxide, and sodium lauryl sulphate(Dangerous). Each 5 mL of brown-coloured suspension contains ferrous fumarate 300 mg equivalent to 100 mg elemental iron. Nonmedicinal ingredients: artificial cherry flavour, caramel, carrageenan, glycerin, methylparaben, propylparaben, sorbitol solution, sucrose, and water. Each mL of light amber to green/gold solution with an aromatic fruity flavour contains ferrous sulfate 75 mg (equivalent to elemental iron 15 mg). Nonmedicinal ingredients: citric acid, flavours (lemon, pineapple, and strawberry), glycerin, purified water, sodium bisulfite, sorbitol, and sucrose. This medication does not contain gluten, lactose, or tartrazine. Each 5 mL of light amber solution with an aromatic fruity flavour contains ferrous sulfate 150 mg (equivalent to elemental iron 30 mg). Nonmedicinal ingredients:citric acid, flavours (lemon, pineapple, and strawberry), glycerin, purified water, sodium bisulfite, sorbitol, and sucrose. This medication does not contain gluten, lactose, or tartrazine. Each red, round, odorless tablet contains 300 mg of ferrous sulfate (60 mg of elemental iron). Nonmedicinal ingredients: carnauba wax, crospovidone, FD&C Blue No. 2, FD&C Red No. 40, FD&C Yellow No. 6, hypromellose, magnesium stearate, microcrystalline cellulose, PEG 400 polyvinylpyrrolidone, povidone, titanium dioxide, and triacetin. Problem with Ferodan is they contain Glycerin. GREAT!! And as always if anyone has any positive / constructive contribution to make or any suggestions regarding an alternative then go ahead and comment. Any stupid / sarcastic / negative comments will be deleted or ridiculed (LOL)..
Alhamdo'lillah the following two restaurants are HMA certified. Please visit these fine establishments and enjoy delicious halal food with family & friends. In response to your E-mails, Walker's has emailed through a vegetarian and alcohol freelist . Interestingly enough, it was due to the confusion that these lists caused, that Walker's liaised with us as far back as 2005 to produce a list of products which were suitable for Muslims, according to Islamic Fiqh principles. In the past, this has been a simple enough task for Walker's to complete, and you the Muslim Consumer benefitted. This is no longer happening. Suffice to say, these lists are not sufficient enough for us to make a decision. As we have said, we do not charge one penny for this service, and so apart from serving the Muslim Community, we really don't stand to benefit financially whatsoever. We would urge you to contact Walker's again, and request them to provide us the information, in the format we require, and provided to us in the past. We would then be able to serve the Muslim Consumer, and Walker's can demonstrate thet they really do care for the Muslim consumer. Walker's (Quakers) has informed us that they will be unable to provide an update to the Foodguide. Based on this information, henceforth we will be unable to field any queries regarding Walker's and Quavers products. We do not charge Walker's (or any other company for that matter) even 1 penny for investigating, checking, and featuring their products. We feel that this is a service in which both companies, and Muslim Consumers mutually benefit. However, responsibilty lies on the part of the company to provide accurate and timely product updates, otherwise the objective is defeated. We feel Walker's has failed dismally in this regard. On the other hand, we have observed KP Snacks which has more products (so more time in completing information for Foodguide Services) have not only been timely, but keen to serve Muslim Consumer's needs. GMWA Foodguide is an 'Ulamaa co-ordinated, non profit organisation that serves UK Muslims. Our decisions are based on Islamic Jurisprudential rulings, which we apply to the detailed information provided to us. As we have mentioned earlier on, no fees are taken for these services from participating companies. Walker's have a list of "certified Halal" Walker's products. We, however don't rely on other organization's certification, but decide on suitability of products according to Shari'ee criteria. For a start, they are not qualified to make the decsion as to what is Halaal or not. This piece is taken from "The 6 Most Horrifying Lies The Food Industry is Feeding You"
Quick, name the most healthy drink your nearest store has to offer. You said orange juice, didn't you? It's what everybody makes you drink when you get sick. Hell, that s@$t must be like medicine or something. And the labels are always about health benefits -- the cartons scream "100 percent natural! ", "Not from concentrate!" and "No added sugar!" A NEW range of gummy sweets, made using only natural ingredients and plant derived bio-gum (alleviating the need for meat based gelatine), has launched in the UK. The new range called The Goody Good Stuff is being positioned as mainstream but benefits from being certified vegetarian, vegan, kosher and halal as well as being nut, dairy, gluten and fat free.